The Adventures of Tioga and George: Whatta Day! Stuff happened today that kept on coming at us from 8am to just a little while ago at 3pm. That's the reason we are making our first Blog post now! 8am - We compiled a shopping list over the passed few days. At 8am, off we went to go shopping. 8:30am - Made an appointment over at RV Trailer Supply to install a dual propane holder onto Scampy’s tongue for Thursday, Dec 1st at 9am. 9am - Boid does not like his new seeds. Went to Kahoots Pet Supply to buy new seeds. Not sure if Boid likes these seeds either. I guess, time will tell. 9:30am - Went to Rite Aid Pharmacy for eye glass cleaner. While at Rite Aid, we were browsing and found a lot of stuff on our shopping list! At O’Reilly we were looking for a blind for Honda’s driver’s side window. 11am - To install the window blind, we had to lower Honda’s driver’s side window. After installation of the blind, the electric window would not go back up! All the other windows went up and down. Only the driver’s side window would not work. 11:30 - Search in the Honda FIT manual for help. Nothing there about the electric window. 11:45am - Looked up the phone number for Honda America, and called service for help. But service asked for data on Honda FIT. Lots of data! VIN number. My home address. Phone number. Email address. She notified me about a recall for driver’s side air bag. I told her that the bag exploded in December 2015. She wanted to know how that happened to the air bag. Told her the bag exploded from a vehicle accident. She wanted to know all about the accident. Question after question….ad infinitum!! After all of those questions [during which about 1/2 hour passed] she informed that I needed to take Honda to a dealer to fix window! 12:30pm - Off to Honda dealer. Honda engine would not start! The engine battery was dead! Went to O’Reilly located next door to Rite Aid Pharmacy. Bought a new battery for Honda. 2pm - Began installing new Honda battery. Had to go back to O'Reilly a couple of times. Once to have new battery checked. Once to return old battery for credit of the battery's deposit. 3pm - Posting about all of this stuff so that you would know about our day! 4pm - One More Thing! You will likely be incredulous to read learn that, just as we were about to leave the parking lot [The same parking lot where we spent most of the day], a boy passed by Scampy and using a key, deliberately put a scratch in Scampy's door! Fortunately, it was a minor scratch. We once more returned to O"Reilly's Auto Parts, told about the boy putting a scratch in Scampy's door. We bought the Formula-1 Scratch Out and a little bundle of polishing cloths. The scratch disappeared. Like magic! 5pm - What else could plague us? We returned to John & Mimi's home. What more could happen to us that is bad while here at the home of our friends? 8pm - IT'S STILL NOT OVER!!!!!! * I went inside the Honda to get the extension cords to connect up to electric power. And locked the Honda behind me. After running the cords from the house to Scampy, I realized that I needed the 30amp to 20amp plug which was inside the Honda. * When I went into my pocket for the keys, the keys were not there!!!!!!!!!!!!!!!! What is this F-c-kin Sh-t!!?? I lit up iPhone's flashlight and went searching everywhere that I could think of. Nothing! I retraced my steps. Nothing! * But I knew that I opened the Honda for the extension cords. I had the keys then. So, I went back several times back over my path, looking in the dark for the missing keys. Finally, there they were! Just in front of the Honda on the street!! 8:30pm - Wait! It's still not over! After getting the electric power to Scampy, I went to wash my hands in the Scampy's kitchen sink. NO WATER CAME OUT! Just the sound of the water pump cavitating [The sound this type of pump makes when the supply of water is missing]. I figured that the fresh water tank must be empty. I went outside to fill it. John has a hose bib in the front of his house in a raised area. I went up on this raised area, and to steady myself in the dark, put my hand out to a tree trunk. But the tree trunk was covered with spines. And I got stuck several places!!!! Not stopping to attend to the bleeding places on my hand, I found the hose bib and connected my hose. When I went to step down from the raised area, it was pretty dark. And I was not able to discern in the dark that what I thought was a 1-foot wall was actually a 3-foot wall! Down I went falling and catapulting across the sidewalk and rolling over on my back ending up in the gutter next to Scampy. During my fall, I tried to stop myself with my hand on the sidewalk. The same hand that got stuck by the tree spines!!!!!!! I was not badly hurt. Just damned pissed off! And went about filling the fresh water tank. Usually, cavitating a water pump for an extended period would destroy the pump. After the fresh water tank was filled, I started the water pump and it worked! The cavitation did not damage the water pump. It is now 10pm. Looks like the "come in threes" thing in your comment was a bit shy of reality. I did not make a count. But maybe it should be "come in sixes"? Yes! But ya gotta love it! I sometimes wonder if we get the whole story! "Depends on when and how often you tune into my blog!" I add to my Blog posts many times during the day. I've been Blogging that way since I began fulltiming in 2003. If you don't tune back in to get caught-up, you may not get the whole story. Wow! You have an inspiring strong will to overcome difficulties. Ouch! What a day you have had. I really hope that is all that will happen to you and that tomorrow will be a better day. Hope you won't be too sore tomorrow. Yes! Tomorrow [which is actually today] is a better day! And, I have a hunch that tomorrow [Friday] will be even BETTER! Say "Hi!" to Kevin for me! Oh my you had a rough day, hopefully thats all behind you and luckily no major injuries. hope you had a hot shower and a bottle of beer or two or three and a good nights sleep. Hope all your problems are over for a log time now. A new month is beginning. 3-foot wall, I hurt all over! Even my knuckles of both hands hurt! Man-O-Man!! Thats quite the day buddy. At least there were no dull moments! You hit the nail on-the-head!! No dull moments. In fact, when yesterday's afternoon rolled around, I was astounded how FAST the hours passed for me! Thank you sooooo much for your comment! Sorry George but I laughed so hard this morning reading whatta day that my coffee went everywhere! We've all had days like this. Love your attitude and altitude! I'm going to try this formula 1. There is always something to learn from others. Thinking back on what happened yesterday, even I had a laugh over it! Now, all of those things that happened, one after another, ad-infinitum...seem like a comedy of occurences to me! Thank you sooooo much for your comment/compliment about my attitude. Altitude? I think that part of your comment went over my head? Was it a rhyme thing? "attitude/altitude?" Luckily, you consider this stuff as challenges. I consider them P.I.A. 's and don't motor home much anymore. "Luckily, you consider this stuff as challenges." That's exactly how I feel! I believe that I'm extremely fortunate to feel that way! John, because you are such a close friend to me, you have a lot of insight into my personality. I'm very fortunate, that we are indeed, very excellent friends for each other! Looking forward to golfing with you mañana! Wow! Your hand looks awful. I hope it looks better when you get it cleaned up. And I hope you have put together a small first-aid kit for Scampy, plus carry a lot of flashlights! My hand actually, with all that blood on it, looked a whole lot better than it felt! I hurt all over! Took a bunch of aspirins to reduce pain, in order to get to sleep. Thank you for asking about Scampy's first-aid kit. Because of you asking, a first-aid-kit is now on my shopping list! Got flashlights though! However, flash lights likely would not have helped with last nite's disaster. 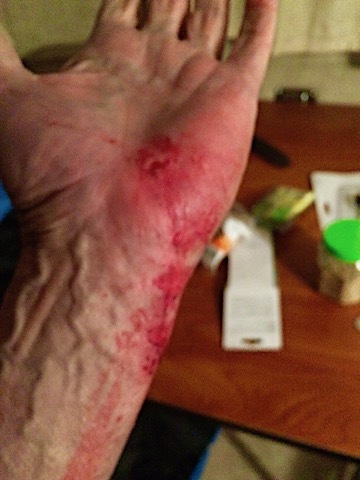 My hands were filled with stuff when I fell off John's front yard wall! No room in my hands for a flashlite. Maybe I should NOT be doing stuff like this by myself when it's dark outside? If I would have asked, John would have helped me. So happy to read that you like my making Blog posts several times a day! "don't get the whole picture"
So far, Thursday is lookin' goooood! OMG George...you had double threes yesterday to make up for a long time of no bad things to come. Today every thing should go according to schedule I believe. Take a hot soak at Twayler when you return. How's Boid doing? Eating his/her seeds? Yes!! Double Three = One Six." Never occurred to me that good times need to be offset by bad times! Are you really sure about that? Hmmmmm? About returning to Twayler for a "hot soak." I have no clue when I actually will head north to Twayler?! Having such a good time fulltime camping in Scampy! Me and Scampy are sooooo good for each other!! About Baby Boid. He loved the seeds that he had. When his seeds got to a low level, I bought him new seeds. I then gave those Boid rejected seeds to John and Mimi for their wild bird feeders. Wild birds loved them! Go figure? So, then I got some "new-new" seeds" Baby Boid is eating the "new-new" seeds. But I am able to see that Boid does not like these seeds, as he liked the old seeds. I intend to shop for the old seeds. Gotta keep my Baby Boid happy! Right? Yes, roll with the punches! Any day you wake up and are able to get out of bed is a good day. The stuff that happens to you during that day is life, which you handle well. Keep up the good fight George you are a joy to read. Your "handle well" and "you are a joy to read" comment/compliments are a joy for me to read! Years ago I started tying a piece of that bright yellow surveyors tape to my key chain. Sure makes the keys easy to spot when dropped somewhere. I am shopping for a chain that attaches my keys to my pants! Don't want to experience lost keys anymore!! It might be wise to go shopping for copies of your keys to hide in Scampy. Hope you are not still hurting much. That puncture looked wicked!